The other reason for my website is that I want to inform others about the disease I have, Scoliosis. and to share my story as a Scoliosis Survivor. 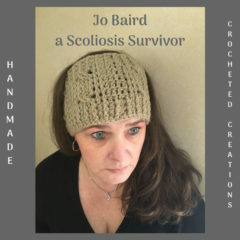 I want to spread Scoliosis Awareness, I want to make others aware of first what Scoliosis is; how they can recognize Scoliosis; things they can do if they have Scoliosis like exercises and hobbies such as Crocheting, and lastly some of the latest treatment options that are available to them. I want to give others hope by helping them cope! I want to make them aware that even though they have this disease they can still be productive by doing things like Crochet. I want to provide them with patterns they can do to get their minds off their pain and make beautiful things in the process, I want to let them know they can Crochet to Cope. My website and business are just getting started, but I have a lot of things I want to share. You can click on the Social Media links at the bottom of this page and start following me! Also be sure to stop back by and check out what my Crafty Hook has created next!